From I-40 East, Take Wade Avenue, then take I-440 outer loop. Exit off onto Old Wake Forest Rd. Stay straight. Name changes to Falls of Neuse Rd. We are on the right, across from Winston's Grill and Ruby Tuesdays. From I-40 West, Take I-540 North and East. Exit on Falls of Neuse Rd. 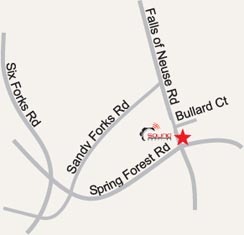 Turn Right onto Falls of Neuse Rd. Stay straight. We are approximately 2 to 3 miles on the Left.